I am getting ready to buy my new Fit in the next few days, and already have plans to camp in it! I've seen lots if the excellent set ups many of you have posted pics of, but I haven't found dimentions for the mattresses that some of you talk about. 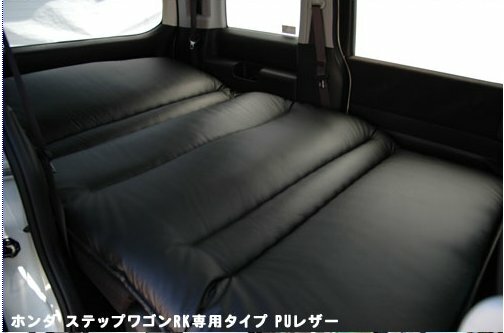 I plan on sleeping in the refresh mode and finding a mattress thick enough that will make a flat, even surface between the mattress and front seats. What size mattress do you use? All the mattresses I've been seeing are 75" long which seems like it would be far too long to fit. Links would be very helpful! I am not opposed to air mattresses, but think I would prefer one of those trifold foam mattresses. I'll be camping with another person, so a mattress that fills up the available space would be ideal! Sounds like you need a honda element and not a honda fit.... lol. I think an air mattress is your only option since you've got to beable to collapse it to drive the car. Lol, if only they had better better mpg! I'm only 5'2, so I think me fitting in the back will be a breeze... Just to find a mattress that will fit is the challenge! Or you could use a regular blow up air mattress with a 12v blower from walmart. Twin Size Double High Quickbed Air Bed with Electric Pump - Rakuten.com . My experience with these types of mattresses are with the kids using them for sleep over parties in front of the TV and they usually leak down after the first two uses. YMMV. If you get a memory foam mattress/mattress topper (or similar), you can cut the foam down to size using an electric knife—the kitchen kind—in a matter of seconds. A nonelectric serrated knife like a bread knife also works fine, but a little more slowly. Obviously it would be a good idea to wash the knife thoroughly before using it on food again. A Queen size mattress topper should be about 60" x 80" so if you cut it in half, you'd have two layers of 60" x 40" wide. IIRC, the platform formed by laying the rear seats down is about 60" long by 40" wide between the wheel wells. But then again, I'm old and I don't always recall correctly. My blow up doll fits just fine. You are correct, it's approx. 60" deep. Good thing the OP is only 5'2". Mine argues a lot less than my ex-wife did. Fewer headaches, too. Have the mattress cut to size! Foam rubber is easy to cut, but I would have it done if you don't feel like it. Some people use an electric carving knife, though. Most foam rubber mattress stores can and will cut you a mattress to any specific size or shape you desire. I once made a pattern of the exact shape and size of the interior of my now-defunct Toyota Tercel wagon, and the foam store made me a foamie that exact shape and size. It fit perfectly! I simply kept it rolled up with a bungie cord or rope to stow it in the trunk while on the road. Dont forget a tent like this. Attaches to the Honda Fit very easily! One of these should work. I had one when I camped in my Nissan Altima. I like it because it rolls up when the trip is over. Wondering how it's going, has anyone been sleeping in the back by now? I wanted to try it out with a foam pad I found in the garage and actually went out last night but it was too warm around here, not good for sleeping in the driveway (and part of me is already thinking I'll wind up with some kind of air mattress anyway). I've been poking around back there in preparation for a week in the Southwest before winter sets in. Looks like the best spot is at an angle with my head tucked up by the front pass door edge, hope I don't kick apart the cheap covering near the tail lights. Yes, as indicated, head behind front passenger seat with thermarest for comfort and at a diagonal with feet to the left rear corner. Worked pretty well for one 5' 9" person. I would not even attempt this in my Fiesta ST because the rear seats do not fold flat and it is a wee bit smaller back there. Welp, I tried it last night in the driveway and it was OK, though I realized I'll need something more than the thin mat I used if I want some serious shuteye. I'm 5-9 too and I didn't feel cramped, though I'll have to take a good look later to make sure I didn't dent any of that molded stuff along the back when I stretched my legs. But it can be done, I know that now.